F/S George Burns Imrie, RNZAF NZ422676 – Navigator. Killed age 22 on the 4th of November 1943. Son of David and Kathleen Margaret Imrie, of Auckland City, New Zealand. Grave location – Allied Plot. grave 51. Four aircraft were detailed to carry out the above operation, with mines of 1500lbs. This was an unfortunate night as three aircraft failed to return and the other aircraft returned early having jettisoned its mines. This aircraft met an enemy night fighter and sustained damage to the port wing, starboard flap, rear turret and many large holes in the fuselage, the rear gunner, Sgt.W. HURDIE, was killed during the combat. The weather was bad and ten tenths cloud made visibility poor. Navigation was good. The missing aircraft were Stirlings MKIII BF461, Captained by P/O.G.K.WILLIAMS, BK&&* Captained by P/O.W.S.MASTERS and XXXXX Captained by F/O. N.WILSON. P/O William Stuart Masters, RNZAF NZ421077 – Pilot. F/O George Burns Imrie, RNZAF NZ422676 – Navigator. F/S Charles James, RNZAF NZ426333 – Air Bomber. Sgt. Reginald James Thomas, RAFVR 1316730 – Wireless Operator. Sgt. Arthur Alfred Copeland, RAFVR 1166829 – Flight Engineer. Sgt. Leslie Grimwood, RAFVR 1438024 – Mid Upper Gunner. Sgt. Lewis Stanley Crawford-Watson, RNZAF NZ42734 – Rear Gunner. F/O John Paul Ingham, RAFVR 132331 – Air Bomber. Killed age 21 on the 23rd of September 1943. Buried Durnbach War Cemetery, Germany.. Grave location – 2. C. 23. Eighteen aircraft were detailed to carry the above operation with incendiary bombs of 30lb. and 4lb.. Three aircraft failed to return, but the remainder successfully dropped their bombs in the target area. This was, undoubtedly, a good attack, concentrated fires which were spreading to the West, and large heavy explosions were seen. Moderate heavy A.A. fire and a large curtain of searchlights were encountered, but caused no trouble. Enemy aircraft were very active and several combats took place. The aircraft captained by W/O. P. MOSELEY had a combat with a JU88 which was claimed as a probably destroyed. In the action our aircraft received damage the Pilot W/O. P. MOSELEY and the Mid Upper Sgt. C(?) MIDDLETON were slightly injured. The aircraft captained by P/O A. BURLEY had three combats with enemy aircraft, one of which was claimed as destroyed, the two as damaged. The weather was good with clear visibility. Navigation was excellent. The missing aircraft were Stirlings Mk.111 EF459 captained by P/O C.C. LOGAN, EH946 captained by F/Lt. G. TURNER , and EH935 captained by F/O L. KIRKPATRICK. P/O Clifford Charles Pownall Logan, RAAF AUS.405918 – Pilot. F/S Geoffrey Phillips Sowerby, RNZAF NZ417243 – Navigator. Sgt. Terence James Hegarty, RAFVR 1030026 – Wireless Operator. Sgt. Thomas Stewart, RAFVR 1117389 – Flight Engineer. Sgt. Frederick Edward William Crowther, RAFVR 1339159 – Mid Upper Gunner. F/S Albert John Knox, RNZAF NZ416006 – Rear Gunner. Stirling Mk.III BF459 JN-E was brought down at Lampertheim, 7 miles North of Mannheim. All but two of the crew died in the crash, The M/U gunner, who was seriously injured, died 10 days later. The only survivor was the rear gunner, F/S A J Knox, RNZAF, who was captured as a P.o.W. All who died were buried at Lampertheim and later reinterred at Durnbach War Cemetery, East of Bad Tolz. Sgt. James Robertson Inglis, RAFVR 979322 – Flight Engineer. Killed age 23 on the 11th of April 1943. Grave location – 18. E. 2. Twelve aircraft were detailed to attack the above targets with bombs of 1000lb and incendiaries of 30lb and 4lb. Three aircraft were forced to return early as they failed to maintain height. Eight of the remaining aircraft successfully dropped their bombs in the target area. It was not possible to see the target owing to thick cloud, a large red glow was nevertheless seen. Both light and heavy A.A. fire co-operating with searchlights was encountered, although they were ineffective. Several enemy aircraft were seen and two short combats took place. There was 10/10ths cloud in the target area, but it was clear and dark above our aircraft. Navigations was excellent. Stirling III, BF455 captained by F/Sgt. Rothschild was hit over the target by A.A. Fire and also chased by enemy Fighters. This caused him to run short of Petrol over the English Channel on the way home, and he eventually crash landed in the sea, 3 miles off Shoreham. The wireless procedure had been perfect, and Spitfires escorted it over the French coast, and a Walrus Flying Boat was waiting for it to crash land. Dingy drill was perfect and all the crew got in safely after an immaculate landing – the Stirling floating for 25 minutes. The final scene was enacted in the Channel as the Walrus collided with the Dinghy and dropped all the crew in the sea. No Ill-effects except for Sgt. Grainger, the Flight Engineer, who suffered from shock. Stirling III BF456 captained by Sgt. Webb failed to return. Sgt. John Webb, RAFVR 657412 – Pilot. Sgt. David Vernon Jones, RAFVR 1337506 – Navigator. Sgt. Daniel Thomas Anthony, RAFVR 1315996 – Air Bomber. Sgt. Richard William Lowther, RAFVR 1380534 – Wireless Operator. Sgt. Leonard Roy Cunningham, RAFVR 643601 – Mid Upper Gunner. Sgt. Edward John Letherbarrow , RAFVR 1315524 – Rear Gunner. Stirling Mk.III BF456 AA-J crashed some 200 miles South East of Frankfurt near Steeg, a small village at 8,700ft in the Lechtaller Alps, Austria. The aircraft was clearly heading in the wrong direction and flying well below safety height in this mountainous region. Sgt. William Gordon Lloyd Inglis, RNZAF NZ411758 – Front Gunner. Killed age 27 on the 12th of August 1942. Son of William and Agnes Inglis; Foster-Son of Mrs. R. Retter, of Ruaroa, Hawkes Bay, New Zealand. Grave location – 9. H. 2. Sgt. Thomas Smith Barclay, RNZAF NZ411358 – Pilot. Sgt. Ronald George Renauf Hodges, RCAF R.92164 – Observer. Sgt. Waring, RAFVR – Wireless Operator. Sgt. Cyril Ingleby, RNZAF 937625/ 118898 – Front Gunner. Sgt. John William Filda Atkin, RNZAF NZ411057 – Rear Gunner. Little is known of the circumstances that led to the aircraft being brought down near Dusseldorf, although flak damage was considered to be the main cause. 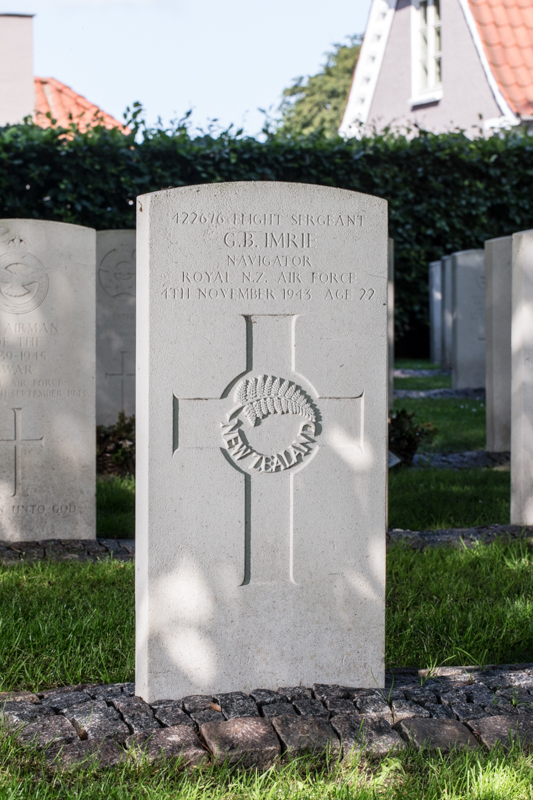 All crew except Sgt Atkin, the Rear Gunner, died.and were initially buried in the Dusseldorf Cemetery. Sgt Atkin escaped with slight injuries and was taken prisoner. Sgt. Owen Alfred Innes, RNZAF NZ421935 – Navigator. Lost without trace age 22 on the 30th of May 1943. Grave location – Panel 199. Twenty aircraft were detailed to carry out the above operation with bombs of 2000lb, 1000lb, and incendiaries of 30lb and 4lb. One aircraft failed to take-off owing to the rear turret being unserviceable, and two returned early. Four aircraft failed to return. The remaining thirteen aircraft successfully dropped their bombs in the target area. Very large fires were seen and also some big explosions. Some heavy A.A. Fire was encountered, but it was ineffective. No searchlights were seen. A few enemy aircraft were seen and one short combat took place, but no damage was sustained by our aircraft. The weather was good in the target area, but visibility was impaired by smoke from the fires. Navigation was very good. The missing aircraft were Stirlings Mk.III BK776 Captained by P/O. R.F.Bennett, Mk.I EF398, captained by F/O. R.B. Vernazoni, MK.III EH881 captained by Sgt. J.H. Carey and Mk.III Bf561 captained by Sgt. S.R. Thornley. F/O Richard Berry Vernazoni , RNZAF NZ416185 – Pilot. P/O Harold Tong, RNZAF NZ416648 – Air Bomber. F/O Charles Hudson Riddle, RNZAF NZ41190 – Wireless Operator. Sgt. Walter Bramwell, RAFVR 1051374 – Flight Engineer. Sgt. Alexander Roger Cardoo, RAFVR 1522196 – Mid Upper Gunner. Sgt. James John Chandler, RAFVR 1699810 – Rear Gunner. Stirling Mk.I EF398 AA-A was shot down at 01:49hrs by a night-fighter (Oblt Manfred Meurer, I. /NJG1) The aircraft crashed between Vlodrop and Roermond (Limburg), while overflying the Netherlands en route to the target There were no survivors. Five crew have no known graves. The two gunners are buried in Jonkerbos War Cemetery after being found in a temporary military cemetery at Venlo. F/S Walter Harrison Irvine, RCAF 75436 – Wireless Operator. Killed age 25 on the 29th of August 1942. Son of Joseph Christopher and Mary F. Irvine, of Saskatoon, Saskatchewan, Canada. Grave location – 9. K. 19. Sgt. Eric Perks, RNZAF NZ411934 – Pilot. Sgt. Reginald George Arthur Lee, RAFVR 1218848 – Navigator/ Observer. Sgt. Walter Harrison Irvine, RCAF R.75436 – Wireless Operator. Sgt. John David Robert McGillivary, RAFVR 922684 – Front Gunner. Sgt. Percy Oaten, RAFVR 959151 – Rear Gunner. The aircraft was shot down by flak on the outskirts of Frankfurt, about 150miles from the target. There were no survivors. They were possibly on their return flight to base after leaving Nuremberg. Their bodies were initially buried in the Okerrad Cemetery, but later reinterred at Durnbach. F/O Arnold Earle Irving, RCAF 19819 – Navigator. Son of The Revd. Joseph Irving and Marjorie Elfreda Irving, of St. Lambert, Chambly Co., Province of Quebec, Canada. Sgt. Joseph Isherwood, RAFVR 1502733 – Air Bomber. Lost without trace age 31 on the 3rd of August 1943. Grave location – Panel 154. Seventeen aircraft were detailed to attack the above targets with incendiary bombs of 30lb and 4lb. Six of the aircraft returned early owing to severe icing and engine trouble, two failed to return. The remainder successfully dropped their bombs in the target area. Large fires and columns of smoke were seen although this attack was not considered to be a successful as the previous one. Moderate heavy and light A.A. fire co-operating with searchlights were encountered, which proved to be ineffective. Some enemy aircraft were seen but no combats took place. The weather was good at the beginning of outward journey, but cloud gathered and was 10/10ths at the target, icing and electrical storms were also encountered. Navigation was very good. The missing aircraft were Stirlings Mk. III EH928 captained by Sgt. Baille, P. and BF 557 captained by F/Sgt. Couper, J.A. Log refers to ‘B’ – unclear if this is the designator or the Flight…. Sgt. Cyril Philip Bailie, RAFVR 1578834/ 155786 – Pilot. F/S Jack Thomson, RNZAF NZ421145 – 2nd Pilot. F/O William Turner, RNZAF NZ416579 – Navigator. Sgt. Edward ‘Eddie’ Millward, RAFVR 1385557 – Wireless Operator. Sgt. William Howard Thompson, RAFVR 1484375 – Flight Engineer. Sgt. Thomas Purdie, RAFVR 1554949 – Mid Upper Gunner. Sgt. Ernest Francis Hunting, RAFVR 1358198 – Rear Gunner. Stirling Mk.III EH928 AA-A was intercepted and shot down by a night-fighter (Hptm Hans Johchim Jabs, IV,/NJG1) and crashed into the North Sea off Terschelling, Frisian Island. 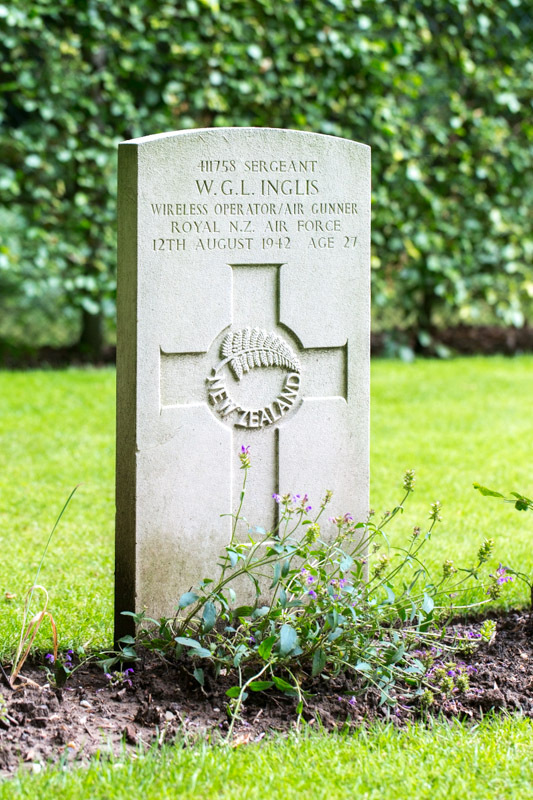 P/O Bailie is buried in Lemvig Cemetery, Denmark. All other crew members are commemorated on the Runnymede Memorial.